The goal of the present article is to illustrate and analyze the applications and the potential of microcomputed tomography (micro-CT) in the analysis of tooth anatomy and root canal morphology. The authors performed a micro-CT analysis of the following different teeth: maxillary first molars with a second canal in the mesiobuccal (MB) root, mandibular first molars with complex anatomy in the mesial root, premolars with single and double roots and with complicated apical anatomy. The hardware device used in this study was a desktop X-ray microfocus CT scanner (SkyScan 1072, SkyScan bvba, Aartselaar, Belgium). A specific software ResolveRT Amira (Visage Imaging) was used for the 3D analysis and imaging. The authors obtained three-dimensional images from 15 teeth. It was possible to precisely visualize and analyze external and internal anatomy of teeth, showing the finest details. Among the 5 upper molars analyzed, in three cases, the MB canals joined into one canal, while in the other two molars the two mesial canals were separate. Among the lower molars two of the five samples exhibited a single canal in the mesial root, which had a broad, flat appearance in a mesiodistal dimension. In the five premolar teeth, the canals were independent; however, the apical delta and ramifications of the root canals were quite complex. Micro-CT offers a simple and reproducible technique for 3D noninvasive assessment of the anatomy of root canal systems. Key words: microcomputed tomography, three-dimensional imaging, root canal anatomy. L'obiettivo di questo articolo è stato quello di dimostrare la validità della microtomografia computerizzata (micro-CT) per visualizzare, analizzare e studiare l'anatomia dentaria ed endodontica in vitro. Sono stati selezionati 15 differenti elementi dentari umani estratti per motivi ortodontici o parodontali, selezionati tra primi molari dell'arcata superiore con un se-condo canale nella radice mesiovestibolare (MB2), tra primi molari inferiori in cui la radice mesiale avesse un cosiderevole grado di curvatura in senso mesiodistale o tra premolari con una o due radici aventi un'anatomia apicale particolarmente complicata. L'hardware utilizzato per la scansione è stato un micro tomografo computerizzato (SkyScan 1072, SkyScan bvba, Aartselaar, Belgium) mentre il software per la visualizzazione e l'analisi tridimensionale dei dati è stato ResolveRT Amira (Visage Imaging). Gli autori hanno ottenuto le ricostruzioni tridimensionali ottenute da analisi micro-CT di 15 elementi dentari umani estratti. È stato possibile osservare dettagliatamente sia l'anatomia endodontica fine che l'anatomia radicolare esterna degli elementi dentari analizzati. Tra i cinque molari superiori analizzati, in tre casi il canale mesiobuccale secondo (MB2) era confluente con il canale mesiobuccale principale, mentre negli altri due campioni dello stesso elemento analizzati essi erano indimìpendenti con forami apicali separati. Tra i molari inferiori due dei cinque analizzati avevano un unico canale nella radice mesiale di forma estremamente appiattita in senso mesiodistale. Tra gli elementi premolari analizzati, i canali se doppi erano indipendenti ma spesso hanno dimostrato possedere una complicata anatomia apicale con delta e ramificazioni molto intricate. La microtomografia offre una tecnica semplice e riproducibile per l'analisi tridimensionale non invasiva dell'anatomia endodontica. Parole chiave: microtomografia, imaging tridimensionale, anatomia endodontica. The complexity of the root canal system has always been a challenge for endodontists and researchers. One of the most important study was performed by Walter Hess , who injected the root canals with a specific ink and visualized the huge amount of variables and complexities of root canal systems, publishing the first extensive report on this subject. Later, other studies [2-5] have examined the anatomy of root canals in permanent teeth using different methods and techniques. In those studies, however, all the methods were not very detailed and/or caused more or less irreversible alterations to the samples. Some examples of these changes are the preparation of consecutive ground sections on extracted teeth [6-9], rendering the surrounding hard tissues transparent through decalcification after permeation of dyes [10-14] and the removal of all surrounding tissue from casts of the root canals with Wood's metal, celluloid or resin [15-18]. Radiographic techniques also have been used to obtain a two-dimensional image [19-23]. Some of these techniques are complicated and time-consuming, and many difficulties can be encountered during their execution, introducing artifacts and distortion of the internal anatomy of the specimens. Furthermore, these techniques do not allow for the observation of the external and internal anatomy of teeth in three dimensions at the same time. Three-dimensional methods for the morphological study of teeth are replacing the more limited two-dimensional techniques. Historically, several techniques have been described for visualization of the 3D anatomy of root canals in human teeth. This usually has been done by reconstructing the image derived from tracings of the contours from serial cross-sections of the specimens, as the first study cited, published by Hess [9, 24-29]. It must be underlined that in the process of making the sections, the specimens are destroyed, and an accurate image cannot be obtained owing to the thickness of the sections. Computed tomography (CT) images can be formed from planar slices through objects. These can be physical sections, optical sections or CT reconstructions  The development of X-ray computed transaxial micro-tomography, or micro-CT, has gained increasing significance in the study of hard tissues [31-35]. Significant improvements in both software and hardware reduced section thickness from conventional CT ranges (approximately 1.5 millimeters)  to those for micro-CT systems: 81 micrometers , 34 μm  and 12.5 μm . The miniaturized CT technique, with a resolution of 100 μm, has proven to be useful as a nondestructive technique for 3D reconstruction of teeth ex vivo [39-42]. It is anticipated that a section thickness of 5 μm may be attainable for ex vivo investigations in the near future . The feasibility of clinical CT studies of human teeth was suggested initially by Tachibana and Matsumoto  in 1990. Micro-CT has been used to observe the structure of bone [44-47] to measure enamel thickness in teeth  and to measure surface areas and volumes of teeth [37, 39, 40, 42, 49, 50]. Root canal instrumentation techniques have been studied using micro-CT [30, 36, 38, 51-56]. Additionally, it has been used for research in restorative dentistry [57, 58]. To date, micro-CT is not available for use in a daily clinical setting; however, the technology of cone beam CT is developing and diffusing rapidly in dental field . Cone beam computed tomography (CBCT) has been introducted to obtain threedimensional information of the maxillofacial district, including the teeth and their surrounding tissues [60, 61]. This technology produces excellent quality with a significantly lower effective radiation dose compared with conventional CT. Periapical disease may be detected with better predictability using CBCT compared with conventional periapical radiographs and the true size, extent, nature and position of periapical and resorptive lesions can be determined. It is possible to study for endodontic diagnosis and treatment plan the presence of root fractures, root canal anatomy aberrations and the nature of the alveolar bone topography [60, 61]. Animal in vivo studies have shown micro-CT imaging to be a rapid, reproducible and noninvasive method that produces results comparable with those of histological sections  and that 3D analysis of micro-CT images has a high correlation with 2-D cross-sections of periradicular lesions . In addition, micro-CT allows assessment of micro-structural features as well as subregional analysis of developing lesions . Micro-CT has potential application in preclinical training of students with regard to tooth morphology and endodontic procedures. The advantage of using this approach is that it can show internal and external dental anatomy and the results of the treatment exercise before endodontic procedures are attempted in the clinic. The aim of this work was to demonstrate the applicability of micro-CT in the analysis of the macro-morphology of teeth through the use of a 3D imaging software that permits all possible visualization, virtual sectioning, and rendering of the raw micro-CT data, which is an excellent tool for the study and teaching of dental and endodontic anatomy. - the premolars had to have a single canal with an intricate apical anatomy (numerous secondary canals). We selected the specimen holder of the micro-CT according to the specimen size and necessary magnification range; throughout our study, we used a specimen holder with a diameter of 15 mm. We fabricated a custom attachment from vinyl polysiloxane for each tooth to exactly fit the specimen and the specimen holder of the micro-CT machine. This attachment allowed a precise repositioning of the specimen in the scanning system along the z-axis (error < 1 voxel) with minimal rotational error (< 1 degree). The analysis of each sample consisted of two stages requiring approximately 4 hours in all: 2 hours for the scanning and 2 hours for the reconstruction procedure. The hardware device we used in this study was a desktop X-ray microfocus CT scanner (SkyScan 1072, SkyScan bvba, Aartselaar, Belgium). We completed the scanning procedure using 10 watts, 100 kilovolts, 98 micro-amperes, a 1.0 mm aluminum filter and x 15 magnification, resulting in a pixel size of 19.1 μm x 19.1 μm. During acquisition we saved hundreds of 2D projections through 180 degrees of rotation in digital format on a computer disk. To gain a 3D perspective, we then transformed the data stored as projections into new two-dimensional images (axial cross-sections) with a pixel size of 19.1 μm x 19.1 μm and a slice thickness of 13.0 μm. The 3D image is achieved by juxtaposition of 2D images of adjacent slices. A computer software analysis system recorded the data to realize a 2D image of absorption coefficients. The use of a charge-coupled device detector allows the production of images with micrometer-sized resolution. We then stored these data for later use. After completion of the scanning procedure, we replaced the samples in the saline solution. The reconstructed axial cross-sections have a 1024 x 1024-pixel (floating point) format. A typical cycle of data collection for reconstruction contains shadow image acquisitions from 200 to 400 views with object rotation of more than 180 degrees. For the reconstruction of complete 3D objects, a serial reconstruction of axial cross-sections can be used. It consists of one acquisition cycle followed by an "off-line" reconstruction of the complete 3D object in a 1024 x 1024 resolution for a maximum of 1024 layers. Typically, these are cone-beam reconstructions. After the serial reconstruction, axial cross sections of the object, as well as a construction of a 3D object's realistic view with possibilities to "rotate" and "cut" the object model can be displayed on the screen. From the reconstruction results, it is possible to reconstruct 3D objects with the use of an external software ResolveRT Amira (Visage Imaging). We rendered a 3D reconstruction of example specimens from the pool of the teeth analysed. The 3D models showed, in great detail, the anatomy of root canals from different angles. The maxillary first molars had three roots with four canals. In three of the five cases, the secondary mesiobuccal root canal joined the mesiobuccal root canal, while in the other two cases they were completely separate. The mandibular first molars had a mesial and distal root. Figure 1A, B is a 3D reconstruction of a mandibular molar viewed from the apical side (Figure 1A), and the distal side (Figure 1B). In Figure 1B the root has been virtually sectioned to visualize the complicated apical anatomy of the distal root canal, that has a bifurcation in the last millimeters of its course. Figures 2A-C represents the same mandibular molar virtually sectioned at the level of the floor of the pulp chamber (Figure 1A), at the medium third (Figure 1B) and at the apical level (Figure 1C). The mesial root is characterized by two root canals, which had a curve in the distal and mesiobuccal senses, in the apical third of the distal root, the single flat-ribbon shape root canal has a big lateral canal that opens in the region ofthe furcation (Figure 2C). In Figure 3A, B the mandibular molar has been virtually sectioned in a bucco-lingual sense in both distal (Figure 3A) and mesial (Figure 3B) roots. It is possible in these sections to clearly visualize the anatomy of the root canals in the bucco-lingual view, that is commonly unaccessible in the clinical radiographic projection. The distal canal has an oval orifice that tends to become flat and ribbon shape in the medium third region. This anatomical feature could determine difficulties in the preparation and obturation of the buccal and lingual extensions of the anatomy. Mesial root canals have a curvature in the BL verse that usually is not possible to be visualized in the bucco-lingual verse. 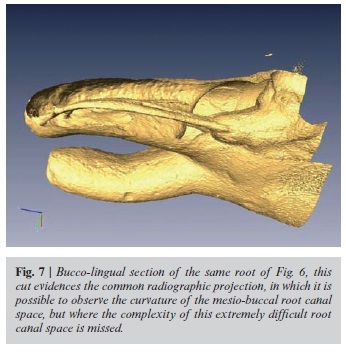 Figure 4 is an example of the 3D imaging, showing one of the specimens among maxillary first molar that were scanned from a buccolingual and a mesiodistal views (Figures 4A and 4B). In this tooth in particular the secondary canal, commonly named MB2 origins, 2 to 3 mm below the level of the pulpal floor inside the orifice of the main MB root canal (Figure 5). This is a location that often presents a clinical challenge in terms of finding and recognizing the presence of the MB2 and its negotiation to the foramen, which in this case had multiple portals of exit (Figure 6). Comparing Figures 6 and 7 it is possible to appreciate how the tridimensional imaging can wonder clinicians about the complexity of the root canal anatomy. 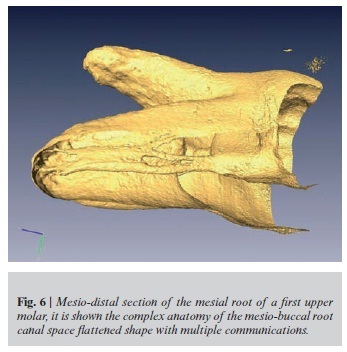 In Figure 6 it is possible to appreciate the extreme complexity of the anatomical interactions between the "so called" mesiobuccal main root canal and the so called MB2. In Figure 7 it is represented what often is visualized by clinical radiology, a single entity that could be a single or multiple root canals, often intended as a circular tube that runs from the orifice to the portal of exit located in the area of the apex. The reality is more complex because despite the presence of two orifices, the pulp space in the mesiobuccal root can be defined as a unique space with multiple interactions and ramifications that is complex to be defined as a "canal" entity. Figure 8 shows the curves in the space of both the distal and mesial buccal roots. Figure 9 is a separate rendering of the root canal system of the palatal root canal seen by the inside and outside views. The extremely complex apical anatomy, as shown in the example figures selected for this paper publication represents a considerable challenge when cleaning, shaping and three-dimensionally filling the root canal system are required for endodontic treatment. The presence of an apical delta is not an uncommon occurrence, even in a single, straight root canal. The presence of an apical bifurcation and four separate apical foramina with multiple communications can further complicate all phases of endodontic treatment. What these samples have in common is the presence of even the smallest details, all reproduced from the original anatomy, thus demonstrating the ability of the micro-CT technique to reproduce three-dimensionally the internal and external anatomical features of teeth. One of the most used system to evaluate and compare pre- and post-operative endodontic treatment, has been the Bramante technique, original or slightly modified [24-29], which allowed to visualize the anatomy of root and root canals. With this technique the authors made serial cross-sections of teeth which were traced in the contours, of the pulp cavities and of the canals of each section. Images were analyzed and measured, in most cases by sumperimposition procedures. More recently, they also entered the data into a computer to produce a 3D image. However, owing to inherent limitations of the technique, such as the width of the slices (0.5-0.7 mm), detailed observation was not possible. In a study in which investigators used histologic slides to reconstruct a 3D image, models of dentin and the root canal systems were produced . In the authors' opinion, however, the above mentioned methodology is not precise and detailed, mainly due to the low resolution of the acquired data. An alternative method fan beam CT was introduced. Gambill and colleagues  produced CT images of teeth to compare three endodontic instrumentation techniques. They constructed the images from 1-mm slices; however, reproducibility was not consistent along the length of the root canals. Using micro-CT with a pixel size of 127 μm, Nielsen and colleagues  demonstrated that it was possible to reproduce tooth anatomy accurately using a noninvasive technique. Shibuya and colleagues  reported that the measurements obtained by this method indeed were accurate. Rhodes and colleagues  compared the internal root canal space and the external surface area using reconstructed micro-CT images and video-digitized images. They found that there was a highly significant correlation between the micro-CT and video-digitized images. Balto and colleagues  and von Stechow and colleagues  demonstrated in vivo that micro-CT imaging yields results that have a high correlation with data obtained from histology. The nondestructive approach in our study made it possible to achieve a 3D analysis of the external and internal macro-morphology of the root complex using a spatial resolution of 13 μm between tomographic slices. It appears that this method is a highly useful tool for studying the external and internal anatomy of teeth. Threedimensional knowledge of root canal anatomy is of great importance, since it allows the transfer of information obtained from laboratory experiments to a clinical setting. One of the advantages of this method is that the dentist can observe the internal anatomy of teeth from different angles. In a pilot study, it was possible, by rotating the sample 360 degrees, to qualitatively assess the effect of root canal instrumentation in molars. Furthermore, it was possible to tilt and rotate the image while areas of interest were magnified. All of these possibilities can be important for clinicians, because through proper use of light, color and texture, a better understanding of dental anatomy as a whole can be achieved. Root canals can be imaged separately or with the tooth superimposed, thus showing the orientation of root canals within a tooth. Not only can this technique be a useful educational tool, it can also have far reaching implications for clinical dentistry. Though we have not discussed this possibility in this article, it is also possible to obtain an animation, showing movement of each tooth around all of its axes. This proved to be a helpful method of visualizing tooth morphology. Several publishedstudies in the dental literature discuss areas that may benefit from micro-CT. For example, the morphogenesis of carious lesions and the development of subjacent tertiary dentinogenesis  have been examined and interpreted on the basis of invasive 2D data [65-67]. The technique reported here is not suitable for clinical use, but CBCT systems have been introduced for imaging hard tissues of the maxillofacial region . CBCT is capable of producing submillimeter resolution (ranging from 400 μm to as low as 125 μm) with images of high diagnostic quality. The scanning times (10-70 seconds) and radiation dosages reportedly are as much as 15 times lower than those of conventional CT scans. Although the CBCT principle has been in use for almost two decades, only recently have affordable systems become commercially available. An increase in availability of this technology provides the clinician with an imaging modality that is capable of achieving a 3D representation of the maxillofacial region with minimal distortion (Figure 10). These systems are promising and eminently more suitable than micro-CT scans, which are limited to ex vivo applications only and are not suitable for patient care. Nevertheless, micro-CT is a powerful tool for research and preclinical education in fundamental procedures of endodontic treatments, as well as for clinicians and researchers who desire to study dental anatomy in great detail. Micro-CT offers exciting potential; however, current imaging times (two hours for scanning a sample and two hours for the reconstruction) are long. The equipment is expensive, and the 3D reconstruction requires a high degree of computer expertise. The data for the present study clearly show that micro-CT offers a noninvasive reproducible technique for the 3D assessment of root canal systems and can be applied quantitatively as well as qualitatively. Due to the fact that CT is nondestructive, it is possible to analyze root canals before, during and after endodontic instrumentation. Internal and external anatomy can be demonstrated simultaneously or separately. A significant amount of information can be gleaned from the scans and slices can be recreated in any plane, while data can be presented in 2D or 3D images. Therefore, its use is not limited to root canal morphology, but can be widely used in dentistry. Applications to restorative dentistry and other areas are now becoming extensive. In the endodontic area, the micro-CT technology is an exciting tool for experimental endodontology and can produce detailed informative images of the anatomy of teeth. The technique is not suitable for clinical use, but it can become a powerful tool for research. It can also allow for better preclinical training in fundamental procedures of endodontic treatments, and it gives clinicians and researchers who desire to study dental anatomy in detail and want to investigate the effect of procedures on the endodontic space a new means of doing so. 1. Hess W. Anatomy of the root canals of the teeth of the permanent dentition: Part 1. New York City: William Wood; 1925. 2. Vertucci FJ. Root canal anatomy of the mandibular anterior teeth. JADA 1974;89(2):369-71. 3. Bone J, Moule AJ. The nature of curvature of palatal canals in maxillary molar teeth. Int Endod J 1986;19(4):178-86. 4. Neaverth EJ, Kotler LM, Kaltenbach RF. Clinical investigation (in vivo) of endodontically treated maxillary first molars. J Endod 1987;13(10):506-12. 5. Fogel HM, Peikoff MD, Christie WH. Canal configuration in the mesiobuccal root of the maxillary first molar: a clinical study. J Endod 1994;20(3):135-7. 6. Black GV. Descriptive anatomy of the human teeth. 4th ed. Philadelphia: SS White Dental Manufacturing; 1897. 7. Green D. Morphology of the pulp cavity of the permanent teeth. Oral Surg Oral Med Oral Pathol 1955;8(7):743-59. 8. Kulild JC, Peters DD. Incidence and configuration of canal systems in the mesiobuccal root of maxillary first and second molars. J Endod 1990;16(7):311-7. 9. Lyroudia K, Samakovitis G, Pitas I, Lambrianidis T, Molyvdas I, Mikrogeorgis G. 3D reconstruction of two C-shape mandibular molars. J Endod 1997;23(2):101-4. 10. Vertucci F, Seelig A, Gillis R. Root canal morphology of the human maxillary second premolar. Oral Surg Oral Med Oral Pathol 1974;38(3):56-64. 11. Tagger M. Clearing of teeth for study and demonstration of pulp. J Dent Educ 1976;40(3):172-4. 12. Vertucci FJ, Gegauff A. Root canal morphology of the maxillary first premolar. JADA 1979;99(2):194-8. 13. Vertucci FJ. Root canal anatomy of the human permanent teeth. Oral Surg Oral Med Oral Pathol 1984;58(5):589-99. 14. Manning SA. Root canal anatomy of mandibular second molars, part I. Int Endod J 1990;23(1):34-9. 15. Preiswerk G. Atlas and text-book of dentistry. Philadelphia: Saunders; 1909. p. 51-2. 16. Skidmore AE, Bjorndal AM. Root canal morphology of the human mandibular first molar. Oral Surg Oral Med Oral Pathol 1971;32(5):778-84. 17. Melton DC, Krell KV, Fuller MW. Anatomical and histological features of C-shaped canals in mandibular second molars. J Endod 1991;17(8):384-8. 18. Gomes BP, Rodrigues HH, Tancredo N. The use of a modeling technique to investigate the root canal morphology of mandibular incisors. Int Endod J 1996;29(1):29-36. 19. Mueller AH. Anatomy of root canals. JADA 1933;20(8):1361-86. 20. Bellizzi R, Hartwell G. Radiographic evaluation of root canal anatomy of in vivo endodontically treated maxillary premolars. J Endod 1985;11(1):37-9. 21. Kaffe I, Kaufman A, Littner MM, Lazarson A. Radiographic study of the root canal system of mandibular anterior teeth. Int Endod J 1985;18(4):253-9. 22. Serman NJ, Hasselgren G. The radiographic incidence of multiple roots and canals in human mandibular premolars. Int Endod J 1992;25(5):234-7. 23. Thomas RP, Moule AJ, Bryant R. Root canal morphology of maxillary permanent first molar teeth at various ages. Int Endod J 1993;26(5):257-67. 24. Mikrogeorgis G, Lyroudia KL, Nikopoulos N, Pitas I, Molyvdas I, Lambrianidis TH. 3D computer-aided reconstruction of six teeth with morphological abnormalities. Int Endod J 1999;32(2):88-93. 25. Hirano Y, Aoba T. Computer-assisted reconstruction of enamel fissures and carious lesions of human premolars. J Dent Res 1995;74(5):1200-5. 26. Berutti E. Computerized analysis of the instrumentation of the root canal system. J Endod 1993;19(5):236-8. 27. Blaskovic-Subat V, Smojver B, Maricic B, Sutalo J. A computerized method for the evaluation of root canal morphology. Int Endod J 1995;28(6):290-6. 28. Lyroudia K, Mikrogeorgis G, Nikopoulos N, Samakovitis G, Molyvdas I, Pitas I. Computerized 3-D reconstruction of two "double teeth". Endod Dent Traumatol 1997;13(5):218-22. 29. Lyroudia K, Mikrogeorgis G, Bakaloudi P, Kechagias E, Nikolaidis N, Pitas I. Virtual endodontics: three-dimensional tooth volume representations and their pulp cavity access. J Endod 2002;28(8):599-602. 30. Rhodes JS, Ford TR, Lynch JA, Liepins PJ, Curtis RV. Microcomputed tomography: a new tool for experimental endodontology. Int Endod J 1999;32(3):165-70. 31. Kuhn JL, Goldstein SA, Feldkamp LA, Goulet RW, Jesion G. Evaluation of a microcomputed tomography system to study trabecular bone structure. J Orthop Res 1990;8(6):833-42. 32. Fyhrie DP, Lang SM, Hoshaw SJ, Schaffler MB, Kuo RF. Human vertebral cancellous bone surface distribution. Bone 1995;17(3):287-91. 33. Davis GR, Wong FS. X-ray microtomography of bones and teeth. Physiol Meas 1996;17(3):121-46. 34. Ruegsegger P, Koller B, Muller R. A microtomographic system for the nondestructive evaluation of bone architecture. Calcif Tissue Int 1996;58(1):24-9. 35. Muller R, Ruegsegger P. Micro-tomographic imaging for the nondestructive evaluation of trabecular bone architecture. In: Lowet G, Ruegsegger P, Weinans H, Meunier A (Ed.). Bone research in biomechanics. Amsterdam: IOS Press; 1997: 61-79. 36. Gambill JM, Alder M, del Rio CE. Comparison of nickel-titanium and stainless steel hand-file instrumentation using computed tomography. J Endod 1996;22(7):369-75. 37. Peters OA, Laib A, Ruegsegger P, Barbakow F. Threedimensional analysis of root canal geometry using high-resolution computed tomography. J Dent Res 2000;79(6):1405-9. 38. Bergmans L, Van Cleynenbreugel J, Beullens M, Wevers M, Van Meerbeek B, Lambrechts P. Progressive versus constant tapered shaft design using NiTi rotary instruments. Int Endod J 2003;36(4):288-95. 39. Dowker SE, Davis GR, Elliott JC. X-ray microtomography: nondestructive three-dimensional imaging for in vivo endodontic studies. Oral Surg Oral Med Oral Pathol Oral Radiol Endod 1997;83(4):510-6. 40. Nielsen RB, Alyassin AM, Peters DD, Carnes DL, Lancaster J. Microcomputed tomography: an advanced system for detailed endodontic research. J Endod 1995;21(11):561-8. 41. Thuesen G, Bjùrndal L, Darvann T. X-ray computed transaxial microtomography in dental research. In: Brender J, Christensen JP, Scherrer JR, McNair P (Ed.). Medical informatics Europe '96, Part B. Amsterdam: IOS Press; 1996. 42. 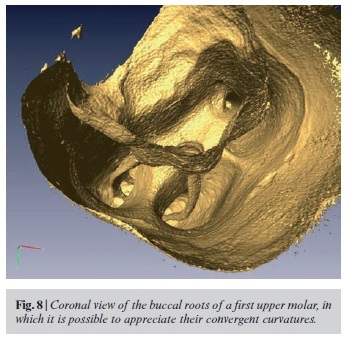 Bjorndal L, Carlsen O, Thuesen G, Darvann T, Kreiborg S. External and internal macromorphology in 3D-reconstructed maxillary molars using computerized X-ray microtomography. Int Endod J 1999;32(1):3-9. 43. Tachibana H, Matsumoto K. Applicability of X-ray computerized tomography in endodontics. Endod Dent Traumatol 1990;6(1):16-20. 44. Elliott JC, Dover SD. Three-dimensional distribution of mineral in bone at a resolution of 15 micron determined by x-ray microtomography. Metab Bone Dis Relat Res 1984;5(5): 219-21. 45. Huiskes R, Weinans H, Grootenboer HJ, Dalstra M, Fudala B, Slooff TJ. Adaptive bone-remodeling theory applied to prostheticdesign analysis. J Biomech 1987;20(11-12):1135-50. 46. Van Rietbergen B, Odgaard A, Kabel J, Huiskes R. Relationships between bone morphology and bone elastic properties can be accurately quantified using high-resolution computer reconstructions. J Orthop Res 1998;16(1):23-8. 47. Hara T, Tanck E, Homminga J, Huiskes R. The influence of microcomputed tomography threshold variations on the assessment of structural and mechanical trabecular bone properties. Bone 2002;31(1):107-9. 48. Spoor CF, Zonneveld FW, Macho GA. Linear measurements of cortical bone and dental enamel by computed tomography: applications and problems. Am J Phys Anthropol 1993;91(4):469-84. 49. Oi T, Saka H, Ide Y. Three-dimensional observation of pulp cavities in the maxillary first premolar tooth using micro-CT. Int Endod J 2004;37(1):46-51. 50. Suto K, Saka H, Ide Y. Three dimensional observation of the orifice portion of root canal in the maxillary deciduous second molars using micro-CT. Jap J Ped Dent 2002;40:541-8. 51. Peters OA, Laib A, Gohring TN, Barbakow F. Changes in root canal geometry after preparation assessed by high-resolution computed tomography. J Endod 2001;27(1):1-6. 52. Peters OA, Schonenberger K, Laib A. Effects of four Ni-Ti preparation techniques on root canal geometry assessed by micro computed tomography. Int Endod J 2001;34(3):221-30. 53. Bergmans L, Van Cleynenbreugel J, Wevers M, Lambrechts P. A methodology for quantitative evaluation of root canal instrumentation using microcomputed tomography. Int Endod J 2001;34(5):390-8. 54. Bergmans L, Van Cleynenbreugel J, Beullens M, Wevers M, Van Meerbeek B, Lambrechts P. Smooth flexible versus active tapered shaft design using NiTi rotary instruments. Int Endod J 2002;35(10):820-8. 55. PetersOA,PetersCI,SchonenbergerK,BarbakowF.ProTaper rotary root canal preparation: assessment of torque and force in relation to canal anatomy. Int Endod J 2003;36(2):93-9. 56. Hubscher W, Barbakow F, Peters OA. Root-canal preparation with Flex-Master: canal shapes analysed by micro-computed tomography. Int Endod J 2003;36(11):740-7. 57. Verdonschot N, Fennis WM, Kuijs RH, Stolk J, Kreulen CM, Creugers NH. Generation of 3-D finite element models of restored human teeth using micro-CT techniques. Int J Prosthodont 2001;14(4):310-5. 58. De Santis R, Mollica F, Prisco D, Rengo S, Ambrosio L, Nicolais L.A 3D analysis of mechanically stressed dentin-adhesive-composite interfaces using X-ray micro-CT. Biomaterials 2005;26(3):257-70. 59. Vannier MW, Hildebolt CF, Knapp RH, Conover G, Yokoyama-Crothers N, Wang G. 3D dental imaging by spiral CT. St. Louis: Mallinckrodt Institute of Radiology, Washington University School of Medicine; 1997. 60. Patel S, Dawood A, Whaites E, Pitt Ford T. New dimensions in endodontic imaging: part 1. Conventional and alternative radiographic systems. Int Endod J 2009;42(6):447-62. Epub 2009 Mar 2. Review. PubMed PMID: 19298577. 61. Patel S. New dimensions in endodontic imaging: Part 2. Cone beam computed tomography. Int Endod J 2009;42(6):463-75. Epub 2009 Mar 2. Review. PubMed PMID: 19298576. 62. Balto K, Muller R, Carrington DC, Dobeck J, Stashenko P. Quantification of periapical bone destruction in mice by micro-computed tomography. J Dent Res 2000;79(1):35-40. 63. von Stechow D, Balto K, Stashenko P, Muller R. Threedimensional quantitation of periradicular bone destruction by micro-computed tomography. J Endod 2003;29(4):252-6. 64. Shibuya E, Matsubayashi T, Shida T. Experimental study for the accuracy micro-CT apparatus. The Shikwa Gakuho 2000;100(11):1221-6. 65. Silverstone LM. Structure of carious enamel, including the early lesion. Oral Sci Rev 1973;3(2):100-60. 66. Bjorndal L, Thylstrup A. A structural analysis of approximal enamel caries lesions and subjacent dentin reactions. Eur J Oral Sci 1995;103(1):25-31. 67. Bjorndal L, Darvann T, Thylstrup A. A quantitative light microscopic study of the odontoblast and subodontoblastic reactions to active and arrested enamel caries without cavitation. Caries Res 1998;32(1):59-69. 68. Scarfe WC, Farman AG, Sukovic P. Clinical applications of cone beam computed tomography in dental practice. J Can Dent Assoc 2006;72(1):75-80. Accepted on 19 December 2011.